Here is what's on in Melbourne in December. December is a busy time of the year for any city, and it isn't any different for Melbourne. The weather becomes more or less predictable as the festive season takes place, and with it the exciting energy from holiday-goers sparks the streets with many things to do. The exciting Japanese Film Festival returns to the Australian Centre for the Moving Image (ACMI) and Hoyts Melbourne Central with its outlandish quirks and astonishing cinematography. December means the return of the much-loved Rooftop Cinema on the top of Curtain House in Swanston Street. With its candy coloured stripy deck chairs and astro turf lawn, reclining in utter comfort is made super easy. Not to mention the open night city views. The Cinema is licensed until 1am and also holds a permanent BeatBox Kitchen, flipping Melbourne's funkiest mushroom burgers to delight you all. The Cinema keeps mildly up to date with the latest releases, but its pride comes with showcasing much-loved favourites such as Blues Brothers, Clerks, Reservoir Dogs and many, many more. I think the best Christmas shopping in Melbourne is at one of the growing artists and makers markets. Lots of uniquely Melbourne wares from little bits and pieces, jewellery to hand-knit scarves, bags and clothes - handmade with love. We have been a long fan of the Rose Street Artist market in Fitzroy, but there are many others as well. 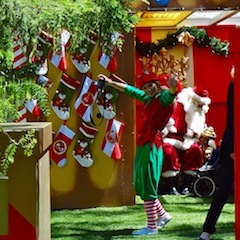 Additionally, there are a few Christmas markets, like the Kris Kringle market at Northcote townhall on Thursday nights in December and the Docklands Twilight market. 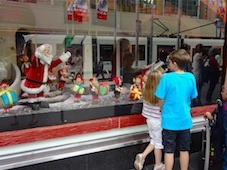 The iconic Myer Christmas Windows are back in place once again this December in anticipation of the big day on the 25th. This year has been inspired by the style and colour of the 1950's, which is shown in the wonderful design of 114 characters across the 6 massive windows. The streets of Melbourne around Christmas time are full of Christmas shoppers, which can become a little to daunting. Pick your times carefully if you want to see the Christmas Windows. Vocal Australia is having its GetVocal End of Year Party with Melbourne's best vocal groups and Capella singers at the Bella Union Trades hall. Salvation Army Christmas Gift Concert - FREE at the Melbourne Convention Centre. Banyule's Carols by Candlelight - a family event with Christmas Art Workshop, Santa and even reindeer, at Poulter Reserve, Greensborough. The Royal Melbourne Philharmonic is performing its annual Messiah by Handel at Melbourne Town Hall. All Nations Carols - featuring local community bands, brass and choirs, celebrating Christmas with a picnic in All Nations Park, Northcote. Mordialloc Carols by the Bay - another popular family event and picnic, and concert of all sorts of band celebrating Christmas, at Peter Scullin Reserve. And the big one, Vision Australia's Carols by Candlelight. This is a ticketed event at Sidney Myer Music Bowl featuring a line-up of celebrities presenting this year's carols, broadcast live throughout the nation. December 24. These are some highlights of What's on in Melbourne in December. The spirit of Melbourne comes to live in its many community events, bars and live performances, which are too numerous to be listed here.